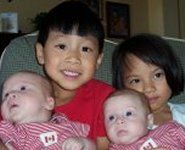 300+ full length adoption articles by adoption specialists, medical experts and adoptive parents to help you adopt and raise your child. Expert and volunteer support for adoptive families online since 1996. If you see yourself reflected or reported here, you may have some apologizing to do. Developmental interruptions are common in adopted babies who are placed after birth. In this sweet personal domestic adoption story, an elementary school teacher shares the joy of the day she learned her baby was born. When a partner chooses infertility, it may be an affirmation of love and commitment. Adoption scams are real, and can be quite cruel. Protect yourself with these professional tips.